Berg’s early lieder owe their existence largely to the young composer’s great interest in literature; nevertheless it was his friend Hermann Watznauer, who actually inspired him to embark on composing his first lieder around 1900/01. And Berg enjoyed himself so much that he continued along the same lines until 1903, completing another 30 lieder; even Arnold Schönberg was essentially fascinated by them: "Berg’s earliest compositions, however clumsy they may have been, already reveal two qualities: first, that to him music was a language and that he actually expressed himself in this language; and secondly: abundant warmth of feeling." 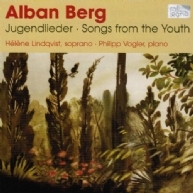 If Alban Berg had not chosen a completely different road later on, he would still be recognized as a direct successor of the Romantic lieder tradition today. But his later compositions, such as his orchestral works, his violin concerto, the great lieder cycles for orchestra and trend-setting operas like Wozzeck or Lulu, soon eclipsed these early compositional attempts. The lieder themselves shall be called upon to testify to their great aesthetic, even poetic merit; and thanks to Hélène Lindqvist and Philipp Vogler, a larger audience is now, for the first time, given an opportunity to study these works. A sonic window to antiquity: Dimitri Terzakis, returning to the colorful world of ancient Greek literature, creates original and highly distinctive sound images.